The founder of Facebook does it. So does the head of the FB — who thinks you should do it too. The first runs maybe the world’s best-known company. The second is in the business of knowing other people’s business. Given they both likely have state-of-the-art fortresses built around their PCs, maybe they know something. What they know is that laptops and tablet cameras can be hacked without users’ knowing it. This is usually done with a remote administration tool (RAT), which by some estimates accounts for upwards of 70% of Trojans, a piece of software that hides on PCs to track activity and sometimes take control. RATs are relatively easy to build and deploy and allow online thugs to capture video without your knowing it. Perhaps the best-known RAT intrusion happened a few years ago in California. Teenage hacker Jared James managed to slip a Trojan onto the reigning Miss Teen USA’s computer and snap images while she changed clothes. He then threatened to ruin her future pageant possibilities by making the images public if she didn’t give him more. And that was just the tip of the iceberg. After surrendering to the FBI, James confessed to hacking the cameras of as many as 150 women. Other such cyber criminals live-broadcast bedrooms on the internet or even actively mess with the women they “slave” – freezing screens, bullying via IMs and emails, and displaying shocking images. The great majority of these criminals perpetrate against women, but men have also been targets. And while many webcam hackers use images and video to satisfy voyeuristic needs and to humiliate victims, others are just in for the money. One Australian man literally caught with his pants down was told to pay $10,000 or be exposed online. He refused, but noted that double standards often mean women feel compelled to comply. So how widespread is webcam hacking? Despite dozens of news stories, official statistics are hard to come by. And as with ransomware attacks, many victims never report the crime. One Australian man literally caught with his pants down was told to pay $10,000 or be exposed online. For cameras embedded in PCs, criminals need access to the PC, as well. This is often done by posing as friend, through a phishing attack, or with some other form of social engineering to trick victims. Okay, I’m sold. But is a piece of tape or sticky note enough? For covering the camera, yes. But this issue highlights the importance of cultivating a security mindset when online. This should include a range of activity such as keeping applications up to date, using strong passwords, deploying email security best practices, maintaining general vigilance when online, and installing proper internet security, like that available from AVG. So while taping over your webcam is smart — and easily reversible if you use a sticky note or a purpose-specific device — this quick fix should really just be the beginning of the measures you take. If tape’s not permanent enough for you, you can also disable your camera altogether. (Keep in mind, though, that you’ll need to reverse the process every time you want to make a video call or capture video.) 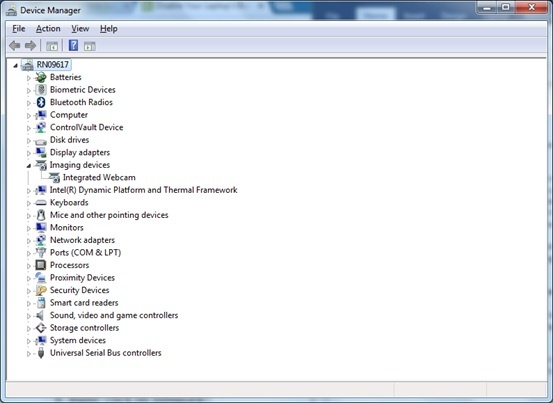 For Windows 8, just use the Start Menu Search and type in “Device Manager” and open it up. Then select Imaging Devices and click “Integrated Webcam”. If it’s not there, try looking under Sound, video, and game controllers. In the pop-up box that opens, select the Driver tab and the Disable button. Note that the name of the camera may be different on your PC than in the screenshots. Also, if you do not have administrator rights, you will not be able to disable the camera. 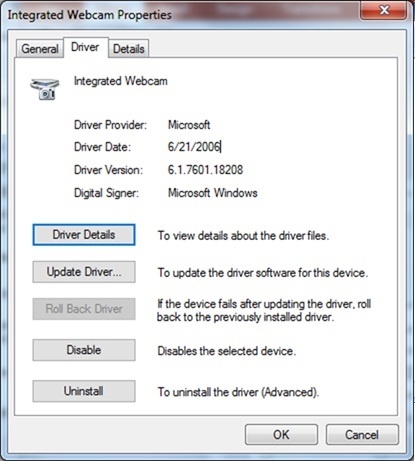 While you’re there, be sure to update your driver as well.